Landy Insurance has integrated PayPal as a means of protecting your personal information and securing your online purchase or renewal of your insurance policy. You DO NOT NEED A PAY PAL ACCOUNT to complete your transaction. You may complete your purchase as a GUEST. You will fill out your online insurance application - then click CONTINUE to review your information. Next, select the gold PayPal button to proceed to the payment page. 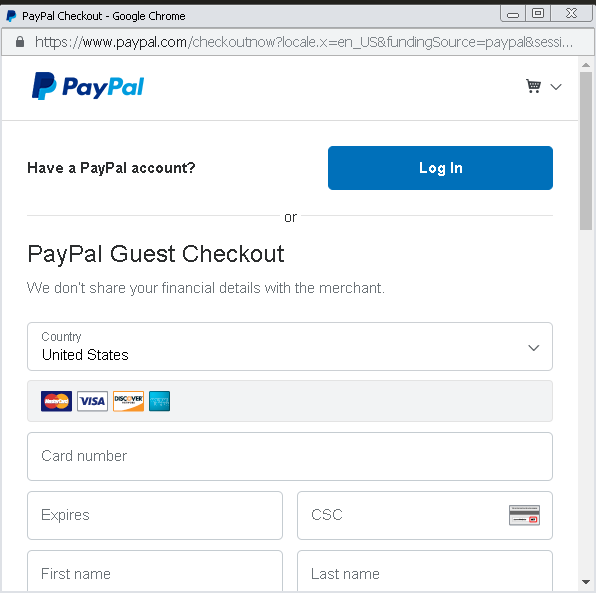 The resulting PayPal screen will allow you to complete your transaction as a GUEST - OR - you may log into your existing PayPal account to complete your transaction. PayPal allows you to securely transmit your payment from a Credit Card (Visa, Master Card, American Express, or Discover), or a Debit Card, linked to your Checking Account or your Savings Account. PayPal provides secure transactions from your account with 24/7 fraud detection and provides a faster checkout experience. Use this link to create a New PayPal Account and begin securing all of your online transactions.